Harry Allen was a Gloucester Councillor from 1978 until 1985, at which time he was elected mayor. He took great courage to approve a 29.4% tax increase in 1989, which allowed the City of Gloucester to come out debt at a time of high interest rates. Because of this, he received death threats and had to wear a bullet proof vest during public consultations. He was voted out of office in 1991 but his successor was able to implement a tax freeze as a result of his courageous decision. The City of Gloucester entered amalgamation with Ottawa free of debt. Before his political career, Mr. Allen was known for his community work in Beacon Hill. He got involved in community and township recreation committees that helped build the Earl Armstrong Arena and the Sawmill Creek Pool in Blossom Park as well as a number of parks. He also helped found the municipal Pineview Golf Course. When in office, he developed a strong relationship with the National Capital Commision which enabled him to have the Rockcliffe Parkway realigned at St. Joseph Boulevard. He also widened St. Joseph Boulevard and the bridge that now bears his name and was involved with the extension of the Queensway in Orléans. Mr. Allen had a passion for public transit and worked with OC Transpo to develop a more efficient transit service in Gloucester. Mr. Allen is a native of Ireland and immigrated to Canada in 1953 and came to Ottawa in 1968.. 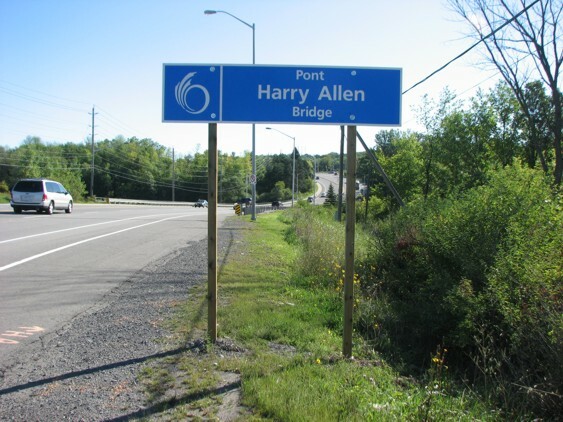 The bridge was officially named on August 24, 2012 and Mayor Jim Watson and Innes Ward Councillor Rainer Bloess recognized his many contributions to the community. 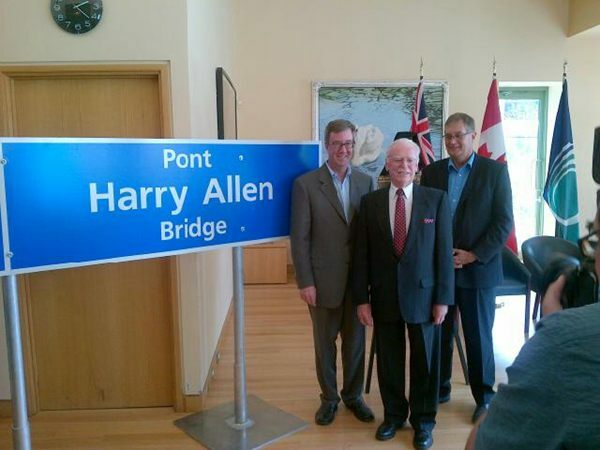 Mr. Allen was joined by family and friends for the ceremonial unveiling of a commemorative plaque and the bridge sign. The Hull Monument was dedicated to the memory of Welsley A. Hull, who died in hospital in South Africa during the Boer War on June 7, 1900. Mr. Hull was 27 years of age. He had been a member of the 43rd Rifles of Ottawa for 8 years and had attended Military School in St. Johns. He joined the Princess Louise Dragoon Guards and went to South Africa with the first contigent of the Canadian Mounted Rifles. He took ill within a few months of his arrival and died. Mr. Hull was the only solidier from Gloucester Township to die during the Boer War. Following his death, the Orange Young Britons of Billings Bridge, of which Mr. Hull had been a member, decided to erect a memorial to his memory. The unveiling ceremony took place on July 1, 1902 in front of a crowd of 1,500 people. The monument was draped with the Union Jack and at the time of the unveiling, 'God Save the King' was sung. 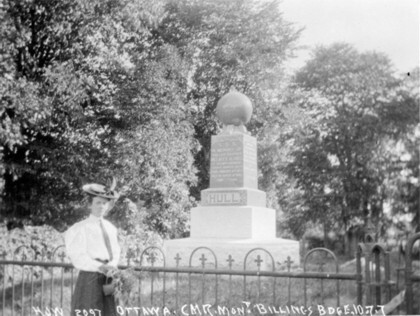 The monument was situated on a small mound adjacent to the Orange Hall at the corner of Bank Street and Riverside Drive. Around 1960, the monument was removed due to road improvements and placed in storage at Capital Memorial Gardens. There was periodic discussion about the return of the monument to public display, but it was not until June 8, 1997 that the monument was rededicated in St. George's Hawthorne Anglican Cemetery on Russell Road, where it can be seen today. The monument was made from Stanstead grey granite and was manufactured by Messrs. Jones & Stevens of Ottawa. It stands 12 feet tall and weighs four to five tons. It cost in excess of $600 in 1902. The Hull Monument is the only 'War Memorial' to exist in Gloucester Township but it never officially served this purpose. The Ellwood Post Office operated from 1906 until 1943 on the east side of Bank Street between Ledbury Avenue and the railway tracks. Quarter Century Ago William Ellis, and Charles O. 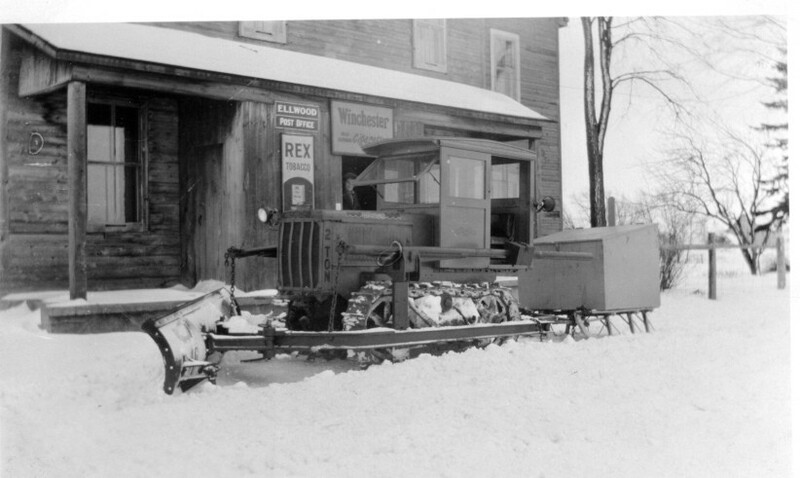 Wood (Now of Ottawa) Secured Needed Post Office. Were Honored by the Name Adopted which embraced both their names. A Happy Thought. 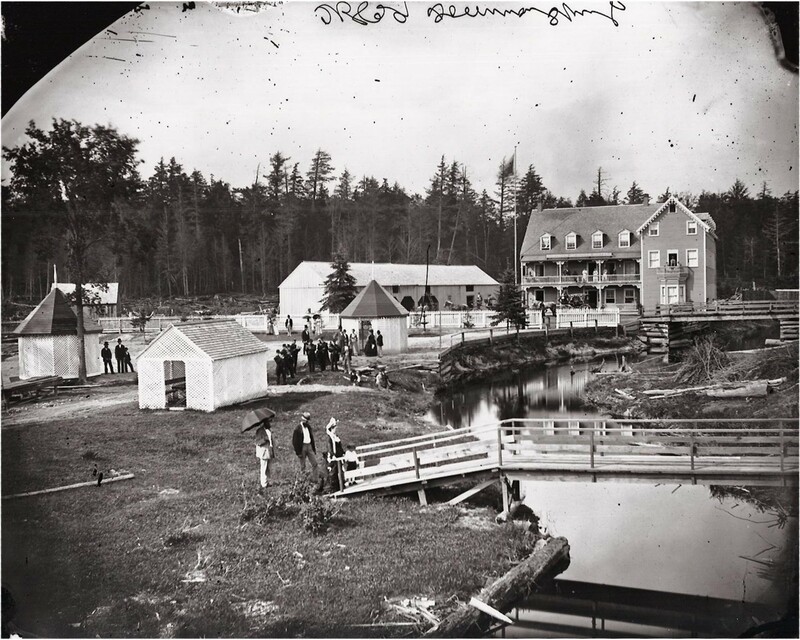 This little story tells how the hamlet on the Metcalfe road now known as "Ellwood" came by its name. A quarter of a century ago, the vicinity of what is now Ellwood, about two miles south of Billings Bridge, having grown to proportions from the ingress of market gardeners and small property holders, there came a demand for a post office. The nearest post office was at Billings Bridge and often the walking was bad. Mr. Charles O. Wood, C.E., now a resident of Cameron street, Ottawa, and Mr. Wm. Ellis, dairy farmer, south of Ellwood, were chiefly instrumental in having a new post office granted by the officials of the P.O. Department. After it had been decided that there would be a new office the question arose as to what it would be called. The P.O. Department asked whether the people had any preference as to name. Messrs. Wood and Ellis consulted the residents. One bright mind suggested a name that would honor both Messrs. Ellis and Wood. He suggested the name of Ell-wood. This suggestion received general approval and the department adopted the name. The post office was placed in the store of Mr. George Cutts and he was made postmaster. And that was the way the name "Ellwood" came. Note - The actual first postmaster was Mrs. Timothy (Jane) Cutts, who had operated a General Store at the location since the 1870s.